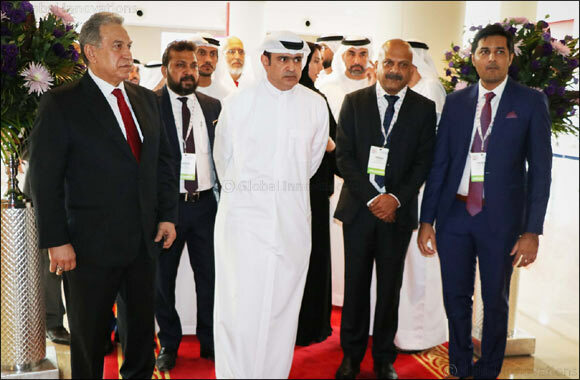 Dubai, UAE, September 04, 2018: His Excellency Sami Al Qamzi, Director General of the Dubai Department of Economic Development, inaugurated today the 2018 edition of Smart Stores Expo at the Dubai International Exhibition and Convention Centre. The event opened its door to retail professionals across the region to showcase the trends and innovations diving the future of retail. H.E. Sami Al Qamzi, led the ribbon cutting ceremonies and toured the exhibition area accompanied by a number of key officials and business leaders from the retail industry. Bannered under the theme ‘Explore the Future of Smart Retail’, Smart Stores Expo has gathered the industry’s most influential business leaders, decision makers and buyers under one roof. Building upon the success of its launch in Abu Dhabi, this year’s event features a three-day exhibit and a two-day conference dedicated to help players reinvent their businesses in a rapidly evolving retail landscape. The Exhibit will consist of four focus areas – Build, Operate, Manage and Retail Leasing – in line with its goal to support the full spectrum of the market’s modern retailing needs. The Conference, on the other hand, will gather the leading thought leaders in the industry to share their views on the trends that will redefine the way modern consumers shop. The Exhibit boasts many new elements supporting the ‘Smart’ retail sector with technology as core focus. Offering unrivalled opportunities to connect directly with global manufacturers and service providers, the show is the ideal place to understand the emerging trends taking place in the market and network with experts from leading international retail chains. It highlights, through vibrant showcase and interactive demonstrations, the current and future innovations retailers can explore as they draw their roadmaps for facing the future. A perfect complement to the Exhibit is the Conference, which features a full line-up of local and international speakers highlighting various products, technology and strategies to improve the customer experience and retail operations. “The shift in consumers’ behaviour is no doubt changing the business of retailing. Now more than ever, there is a need for retailers to address the future and adopt innovations that are moving the field forward. Smart Stores Expo presents all the opportunities to help retailers engage their customers and keep them coming back. This is exactly the reason why we are here – to meet the retailers and new business partners, and present to them the future technologies in retail that makes shopping a pleasure to their customers,” said Nainan M. Kurian, CEO & Managing Director, Technowave Group, ME & India. Technowave provides an innovative Auto ID technology in the UAE, with operations in Middle East and India. Among the solutions they are showcasing at the event are a broad range of the latest Barcode/RFID technology, In-Store Automation, Inventory Tracking software, and Barcode Label Printers. Smart Stores Expo 2018 is well-supported by both local and international retail leaders. The show runs until September 6 at Hall 3 of the Dubai International Exhibition And Convention Center.